How to use the Project Management Lifecycle Guide-through? 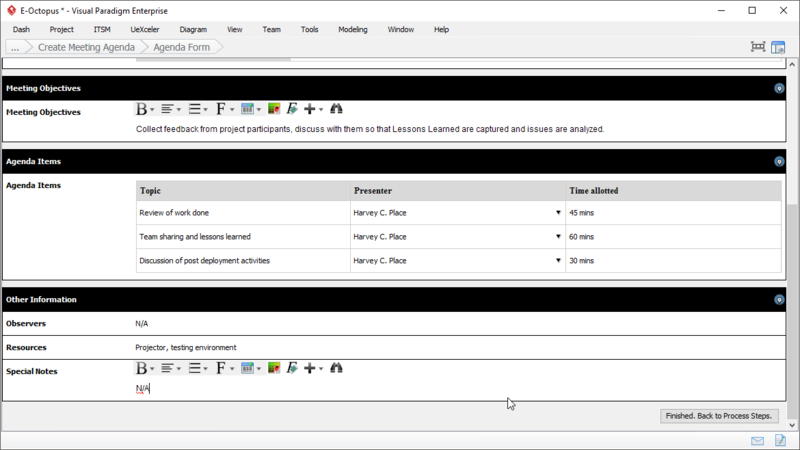 Meeting Agenda is one of the project management deliverable you can create with our project management lifecycle tool. An agenda outlines the things to be discussed in a meeting. This activity guides you through the development of an agenda. This article shows you how to develop a Meeting Agenda. Provide a summary of agenda, which includes the date and time, location, person who prepare, facilitate and attend the meeting, and any related documents that will be used/discussed/communicated in the meeting.